It’s official: gas-guzzlers are out and electric cars are in—at least if Canadians get their way. Long gone are the days when EVs were loved only by wonky environmentalists (although those wonks might enjoy the upcoming EMC trade show). 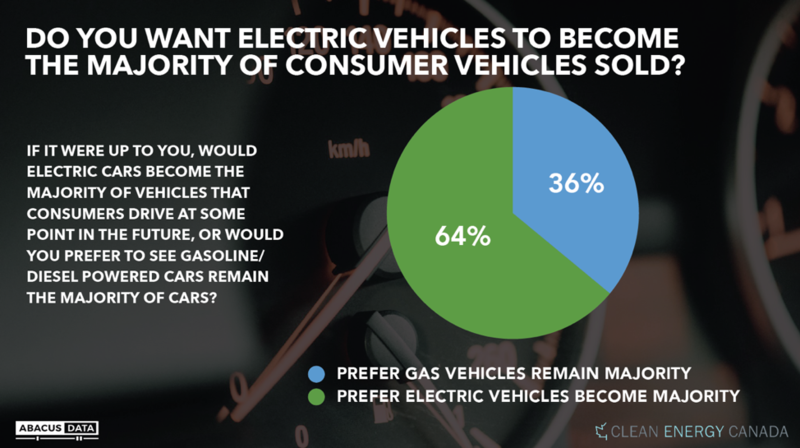 According to a new poll from Clean Energy Canada and Abacus Data, most Canadians (64%) want electric cars to become the majority of cars on the road, while almost three-quarters expect to see them become the norm. And it’s about to get easier for Canadians to make that happen. The federal government’s pre-election budget is expected to include EV purchase incentives, something Clean Energy Canada has been calling for. The new subsidies will make it even cheaper to go electric. New Mexico is planning to source all of its energy from renewables by 2040. Yes, you read that right. One of the U.S.’s largest oil, gas, and coal producers has decided that renewables are actually better. Most of the energy is expected to come from wind and solar. The U.K. poked its head out briefly from under the Brexit blanket this week for some clean energy leadership. Gas heating in new homes will be banned after 2025, to be replaced with “heat pumps and with ‘world-leading’ insulation standards.” The gas ban was joined by a commitment to source 30% of the U.K.’s power from offshore wind. The Tesla Model Y is here. And it can be yours for US$39,000. Like all the Teslas, it can go like stink (0-60 mph in 3.5 seconds) with a range between 370 km and 480 km (that’s slightly below the Model 3, given Model Y’s bigger size). But is Tesla losing its edge? In the Chinese market, for instance, the new Model Y will join 48 fellow electric SUVs, many of which are cheaper and easier to access. Quebec-based manufacturer Lion Electric has come roaring onto the electric truck scene this week with the new Lion8 urban delivery truck. The new Lion already has its claws in the Quebec market, with plans to deliver the Lion8 to the government-run alcohol distributor SAQ. Beer tastes best when it’s delivered emission-free. Boosting the oil patch with pipelines alone may be a bit of a pipe dream, according to this articlein the Financial Post. The oil patch’s problems are bigger and more global than that. Take the “financier’s carbon tax”: big investors, like pension funds, are steering clear of companies that pollute above a certain threshold, putting financial pressure on them to lower their emissions—sort of like a carbon tax. $100 million of government funding is on its way to Albertan clean transport, while another $415 million is earmarked for cleantech developments in natural resource extraction projects, including oilsands and mineral extraction. Especially, when you consider a study by UN Environment, which suggests half the world’s emissions come from natural resource extraction. Investing in the associated cleantech is more than just a smart idea—it’s essential. Clean Energy Review is sponsored in part by Genus Capital Management, a leading provider of fossil-fuel-free investments.